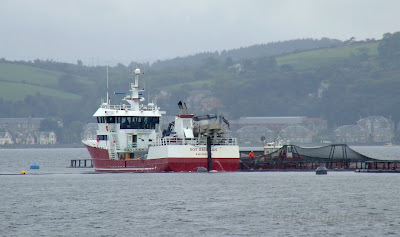 Another Norwegian live fish carrier was seen at Ardyne today, working at the Lighthouse Caledonia fish farm. ROY KRISTIAN is owned by Sølvtrans, and was originally named RUNE VIKING when new in 2001. She is a little smaller than the vessels seen at Mallaig yesterday, at 40.6 metres overall, and 496 gross tons. Her cargo tank is 650 metres³ and she sailed tonight for Mallaig.